AIR TASER is the premier non lethal weapon in the world. Used by leading police agencies and security organizations, the AIR TASER offers unparalleled stopping power without causing any long term injuries. See bottom of page for more details. MODEL #34002: AIR TASER with Laser Sight Combination Package Includes: AIR TASER Powerhandle Laser Sight Module 2 Air Cartridges High Impact Storage Case Practice Target 30 Minute Training Video Owner’s Manual 9 Volt Energizer Battery Lifetime Warranty. MODEL #34000: AIR TASER System Includes: AIR TASER Powerhandle 2 Air Cartridges High Impact Storage Case Practice Target 30 Minute Training Video Owner’s Manual 9 Volt Energizer Battery Lifetime Warranty. MODEL #34100: STUN TASER is the power handle included in the Air Taser Kit without the accessories. You may add cartridges to make it a complete Air Taser. By itself it works the same as a regular stun gun... simply touch the assailant. You may also add the Laser Sight. MODEL #34220: 2 pack of Air Cartridges. Reload your AIR TASER in less then a second with replacement Air Cartridges. Price shown is for two cartridges. MODEL #34720:LASER SIGHT Module (Laser Only) Laser Sight fits onto AIR TASER and illuminates target with a bright red laser dot. Powerful Deterrent as well as aiming aid. HOW DOES AN AIR TASER WORK? Upon firing, compressed nitrogen projects two AIR TASER probes 15 feet at a speed of 135 feet per second. An electrical signal transmits throughout the region where the probes make contact with the body or clothing. The result is an instant loss of the attacker’s neuromuscular control and any ability to perform coordinated action. AIR TASER uses an automatic timing mechanism to apply the electric charge. The AIR TASER releases an electric current in a pre-set time sequence (an initial seven seconds followed by several 1.8 second breaks for a total time of about 30 seconds in each cycle). This cycle ensures that the nervous system of the target does not recover instantly to allow him to remove the probes. The follow-on bursts disrupt the process of re-equilibration of the nervous system. While the target is disabled, the user can place the device on the ground and escape. HOW CAN THE AIR TASER BE SO EFFECTIVE YET NON-INJURIOUS? The AIR TASER does not depend upon impact or body penetration to achieve its effect. Its pulsating electrical output interferes with communication between the brain and the muscular system, resulting in loss of control. However, the AIR TASER is non-destructive to nerves, muscles and other body elements. It simply affects them in their natural mode. More importantly, no deaths have ever been directly attributed to the TASER . WHAT HAS TESTING REVEALED REGARDING THE AIR TASER? Anesthesiologist and specialist in medical electronics, Dr. Frank Summers, MD of St. Joseph’s Hospital, Orange, California, directed tests of volunteers at St. Joseph’s in 1971 and 1974. Dr. Summers stated, "...We undertook this [volunteer test] in the operating rooms at St. Joseph’s Hospital. We had an assembly of cardiovascular surgeons, cardiologists... we had a real [TASER]. We tested extensively and made movies. The tests were impressive. We monitored all parameters of physiology, including electrocardiographs. The tests did not produce any lethal effects and we found that the background work that had been done did indeed pan out in practice." The AIR TASER’s output is well below the level established as "safe" by the federal government in approving such devices as the electrified cattle fence. In a medical study of the Model XR 5000Ô electronic stun gun, Dr. Robert Stratbucker of the University of Nebraska Medical Center confirmed that the T-Wave does not interrupt the heartbeat or damage a pacemaker. Any modern pacemaker is designed to withstand electrical defibrillator pulses that are hundreds of times stronger than the AIR TASER’s output. The AIR TASER current of 0.3 joules is well below the 10-50 joule threshold above which cardiac ventricular fibrillation can occur. High voltage, in itself, is not dangerous. One can receive a 25,000-volt shock of static electricity from a doorknob on a dry day without harm. The physiological effect of electrical shock is determined by: the current, its duration, and the power source that produces the shock. The typical household current of 110 volts is dangerous because it can pump many amperes of current throughout the body indefinitely. By contrast, the AIR TASER power supply consists of an alkaline 9-Volt battery that is capable of supplying less than three watts of electrical power for a few minutes. No. The output is metered by the electronics and the electrical energy in each pulse is always the same, regardless of the target condition. The electrical output will not be transferred from one person to another even if they touch. AIR TASER, Inc.’s president has been stunned by an AIR TASER while standing in water to emphasize this point. A person hit with an AIR TASER will feel dazed for several minutes. The pulsating electrical output causes involuntary muscle contractions and a resulting sense of vertigo. It can momentarily stun or render an attacker unconscious. Yet, the AIR TASER’s low electrical amperage and short duration of pulsating current, ensures a non-lethal charge. Moreover, it does not cause permanent damage or long-term aftereffects to muscles, nerves or other body functions. A January 1987 Annals of Emergency Medicine study reported TASER technology leaves no long term injuries compared with 50% long term injuries for gun shot injuries. The AIR TASER can be used in a touch-stun mode. The user is thus provided with a final backup if the probes miss the target. Should the user miss or engage a second attacker, he can touch the unit directly to the target and it will work like a powerful touch-stun device. As long as the spread of the probes is at least six inches, the AIR TASER will be extremely effective. To ensure that the spread is greater than six inches, the AIR TASER should be fired at a target several feet away. The optimum shot is from seven to ten feet away form the target to achieve maximum effect. At seven to ten feet away - the spread of the probes will be approximately 16 inches, ensuring that the target receives the most efficient T-Wave flow. DOES TEMPERATURE HAVE A DETRIMENTAL EFFECT ON THE AIR TASER? No. 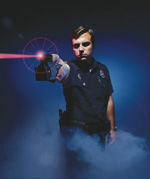 The AIR TASER utilizes compressed nitrogen (an inert gas). The AIR TASER compressed air capsules have successfully held their charges at temperatures of minus 20º F and up to 160º F. Moreover, altitude will not adversely effect the firing of an AIR TASER. In addition, the temperature will not effect the T-Wave. However, as with any product containing polycarbonates and other thermoplastics, the AIR TASER and Air Cartridges should never be left in direct sunlight.